One of my favourite go-to lunches is this Curry Chicken Salad recipe! Things are lightened up a tad with a combo of Greek yogurt and mayo and some diced apple is added to the mix for sweetness and texture. So yummy! Can you believe it’s almost the weekend again? Did ya do anything special yesterday to celebrate Valentine’s Day? As I mentioned earlier this week, fur baby had his 8th birthday yesterday so, of course, he was spoiled rotten with treats and toys (that were destroyed in 5 minutes flat). But, boy, those 5 minutes were fun! We are planning on celebrating Valentine’s Day this weekend with some homemade Indian food, which includes my veg korma (my take on my favourite take out dish), among others. Hubby and I plan on preparing it together while listening to some records and having a glass of vino. The little things, am I right? Can’t wait! Anywho, onto this curry chicken salad recipe, shall we? What Goes in Chicken Salad? How to Make Chicken Salad Sandwich? What makes this chicken salad sandwich extra easy is that I used leftover rotisserie chicken. Those are so freakin’ convenient, am I right?? If you don’t have any hanging around your fridge, not to worry, just cook up some chicken and let it cool for this recipe. You can even double the batch of the curry chicken salad mixture to have ready for a couple day’s worth of sandwiches for easy brown-bagging-it lunches. Buuuuut, this isn’t just any chicken salad sandwich recipe! It’s a healthy chicken salad curry style! Grab a bowl and combine cooked chicken, apple, yogurt, mayo, chives, curry powder, lime juice, salt, pepper and cayenne. Stir well to combine and get all those chunks o chicken covered in that creamy curry goodness. Toast some bread (optional), spread some may over and divide the chicken salad among two slices. Top with remaining two slices of bread. Optional – throw some greenage on there for added oomph, like arugula, baby spinach or butter lettuce. How Long Does Chicken Salad Last? Properly stored in the fridge and assuming the chicken was freshly made, chicken salad should last 3-4 days in the fridge. After that, I’d toss it out. What Goes with this Chicken Chicken Salad Recipe? I don’t often drink soda, but I tell ya, when I have any type of ‘salad’ sandwich, I love to enjoy it with a soda. Do you have any food combos that you have got to have? Try chicken salad sandwich with grapes (I like to halve them). Even chicken salad sandwich with raisins would work wonderfully. Rather not have fruit? Try chopped celery instead. Not into fruit or veggies with chicken salad? Omit and this sandwich will still be delish. Want things even healthier? Omit the mayo entirely and replace with all Greek yogurt. Looking for more Easy Curry Recipes? Check These Out! Hope you love this easy curry chicken salad with apples as much as we do! Until next time, take care and chit chat again soon! Have a wonderful weekend! 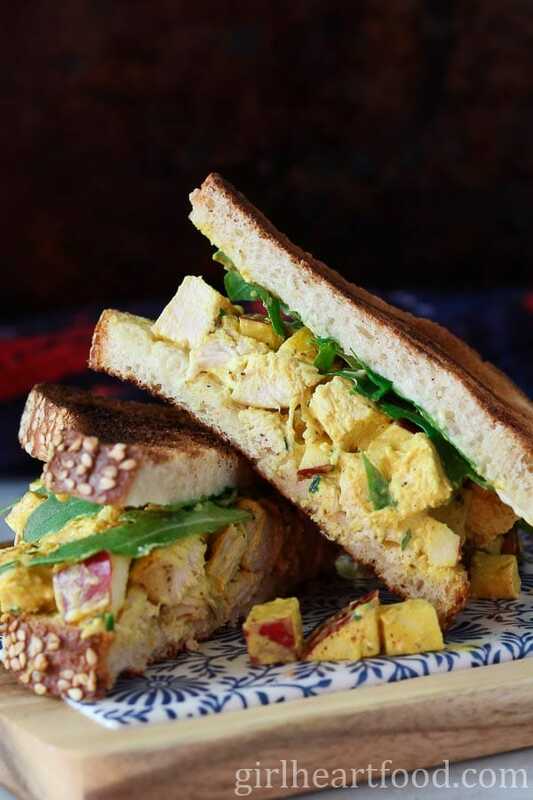 This Curry Chicken Salad Sandwich with diced apple and arugula makes for one quick, easy and delicious lunch! Combine all ingredients (except bread) in a bowl, stirring to combine. Toast bread to desired doneness, spread with mayo and divide curry chicken salad mixture amongst two slices of toast, topping with other 2 pieces of toast. Enjoy! Optional - add some greenage to this curry chicken salad, like arugula, baby spinach or butter lettuce. 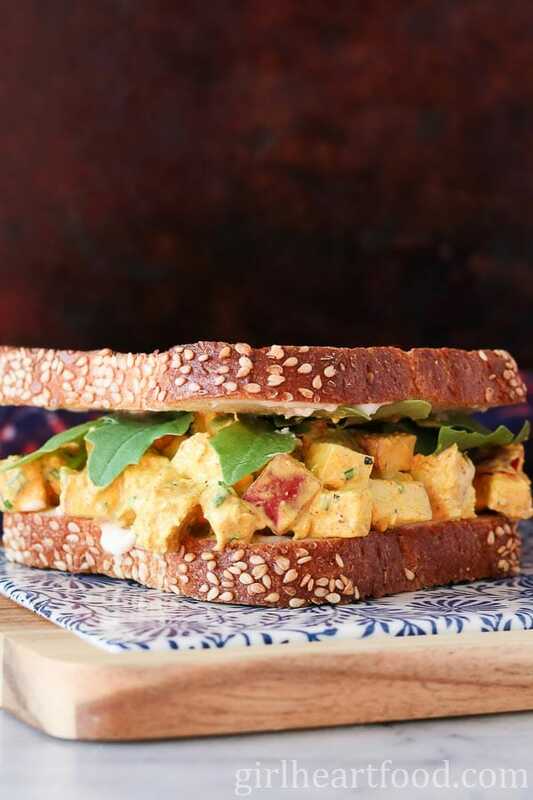 class=”alignnone size-full wp-image-9048″ src=”https://girlheartfood.com/wp-content/uploads/2018/05/Curry-Chicken-Salad-Sandwich-Tall-Pin-2.jpg” alt=”A curry chicken salad sandwich with arugula alongside an apple and some carrot sticks.” width=”600″ height=”900″ data-pin-description=”One of my favourite go-to lunches is this easy Curry Chicken Salad Sandwich! Things are lightened up a tad with a combo of Greek yogurt and mayo and some diced apple is added to the mix for sweetness and texture. 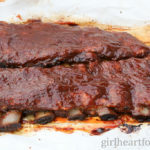 Hi Dawn – I loved this recipe! So tasty and healthy. I made 2 changes – used wraps instead of bread and added arugula. Though from the photo, it looks like there are some greens in it. This is a keeper! Hi Amy – so happy to hear that!! It’s a favourite of mine for sure 🙂 Arugula is exactly what I used in the photo. On a wrap sounds delicious too! Thanks for letting me know- made my day! I missed seeing this last week, so even though this is very very late, Happy 8th birthday to your fur baby, Dawn! BTW, this curried chicken salad looks so good – I don’t think I’d need a sandwich – just a spoon and then I’d lick the bowl/pan clean! Perfect way to use up any leftover chicken. Heck, I’d even cook up a chicken breast just to make this chicken salad! Hope fur baby had an excellent bday and your weekend has been filled with fun! I absolutely HAVE to have a pickle with my sandwiches 🙂 I would love, love this sandwich for lunch, and I know hubby would rave about it too!! The apple is such a great addition! Perfect little weekend lunch to whip up – I will have to try it (pinned). Enjoy your V-day celebrations this weekend Dawn!! Right?! Thank you Katherine 🙂 Hope you enjoy it! Sounds like it’s going to be a wonderful quality time with the hubs this weekend. Enjoy!! My hubs is not a fan of curry so I don’t make it much, but I’ll need to make this sandwich for me, myself, and I because it is looking scrumptious! And I love the addition of apple for sweetness and crunch! Totally! Thank you Thao 🙂 Hope you had a great weekend too! Thanks Jessica! It sure is 😉 Have a lovely weekend! Whelp, I’m all kinds of hungry right now because of this recipe. I’ve had plenty of chicken salad in my life but I don’t’ think I’ve tried curry chicken salad before. Sign me up because it looks amazing! I am always up for a good lunch recipe and this salad sandwich has the potential of becoming my new favorite one, Dawn! I love the combo of ingredients which I wouldn’t usually mix. I love your plan to celebrate Valentine’s this weekend! And you’re right, it’s definitely the small things that bring joy! Chicken curry sandwiches are so good! I never make them enough. This sounds like a tasty, lightened up version. I don’t drink soda but absolutely love a side of pickles with any sandwich!! Happy weekend Dawn! Thanks Leanne! Gotta have the pickles! Kosher is my fave 🙂 Happy weekend to you too! This is like the best chicken salad ever. Can you believe I didn’t even have lunch today? I can seriously bite into my screen, so starving and all I have is a jar of peanut butter… and beer, but cannot rely on it since I need to drive, lol. Crazy, crazy day! I love the toasted bread. I either have to have crusty, fresh bread or toasted sliced, so right on:) And I am glad you will be making more Indian food this weekend. Maybe I get to steal a glance? Will some of it make to the blog?. Happy Valentine’s this weekend:) and belated B-day wishes to cutie pie. Love reading your thoughtful comments! You’re seriously too kind, Milena! Yes, check in on IG – I’m sure I’ll have some snaps there in the stories 😉 And perhaps some of it will make it to the blog…not the batch we are making this weekend, though…it’s purely for cooking pleasure, lol. Oh – and the eating pleasure 🙂 Any beer recommendations to have with? Riley says thanks for the b day wishes! Have a great weekend, you guys! awww, happy 8th to your adorable Fur Baby! You know you have me drooling over these sandwiches. I make a lot of chicken curry salad, but hadn’t considered making sandwiches. And I love that you lightened this up a bit with yogurt. Looking forward to sinking my teeth into one of these! This sandwich looks so yummy. I love chicken curry, but I’d never have thought of making a curry chicken sandwich. LOVE! Hope you have a fabulous belated Valentine’s Day this weekend, Dawn! I love curry Dawn, so I’ll definitely need to whip myself up a few of these sammies! Love that you added the Greek yogurt along with the mayo. I can’t wait to give your recipe a go! Hahaha! Riley and Cookie would be good friends. She loves pulling the squeakers out of her toys. . .I make a game out of trying to find new ones that are indestructible :). (Whoever calls them indestructible hasn’t been mom to a terrier, ha!) Glad you guys had a fun day yesterday and your weekend plans sound awesome. As does this chicken salad. I LOVE curry. Have a great weekend! Hah! I totally understand the whole “toys destroyed in 5 minutes” thing. It boggles the mind how they fit so.much.stuffing in one of those things! To be fair, Max hasn’t been as destructive as he’s gotten older, but still. Switching gears to these sandwiches, I’ll take one to go for lunch today! I’m brown-bagging lunch at the curling club today, and I would kill to have one of these in my bag! It sounds delicious!! I’m a huge fan of curried chicken, so I have no doubt that I would love this sandwich 🙂 Looks perfect! I’m sure you would 😉 Thanks so much, Jennifer!